Alex Ross' book on 20th-century music "The Rest is Noise" is distinguished by some fine primary research of historical sources, not the least of which is his look at the trend towards popular art in post-New Deal art of the 1930s. This populist streak was linked to Socialist ideology and an admiration for Communist Russia. Prominent examples are the opera "The Cradle will Rock", many novels (perhaps best exemplified in Christopher Isherwood's novella "Prater Violet", inspired by a filmmaking experience in the 1930s, which has an explicit message that art must return to its populist roots) and - the subject here - composer Aaron Copland's turn away from the modernist style he pursued into the mid 1930s and towards a more populist idiom. This turn, certainly socially abetted by Copland's position as a gay Jewish New Yorker with heavy ties to bona fide socialists, was a felicitous one from an artistic perspective. Copland's earlier modernist music had shown a personal inclination to "white note" harmonies, simple rhythms, and transparent instrumental arrangements, a set of traits which transferred well to the new idiom Copland tackled with his opera "The Second Hurricane" and El Salon Mexico, still one of his most popular orchestral pieces. These technical characteristics work together well in an idiom slanted towards populist accessibility. 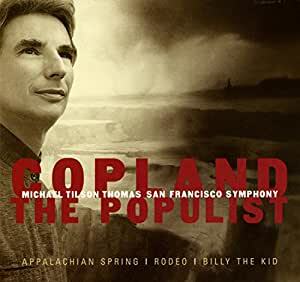 The three orchestral works programmed by Michael Tilson Thomas in "Copland the Populist" include his most famous and maybe his best score, "Appalachian Spring" (1944), and two works right behind it in terms of fame, "Billy the Kid" (1939) and "Rodeo" (1942). Tilson Thomas' typically relaxed interpretations are I think perfectly suited to Copland's style and, joined to skilled playing by the San Francisco Symphony and the excellent engineering Tilson Thomas as usual receives on his BMG sessions, makes for a perfect interpretation of the three ballets. Tilson Thomas' "Appalachian Spring" is absolutely outstanding and by itself is reason enough to buy this disc. I compared the recording with the excellent one done by the composer and the Boston Symphony. Copland's own version is about ten minutes shorter, pointing both to Tilson Thomas' gentler tempi and the inclusion of a dark, disturbing scene with an itinerant preacher in the middle of the "Tis a fit to be simple" variations, a scene that is typically omitted. Is Tilson Thomas' interpretation definitive? I probably wouldn't use a loaded term like "definitive" but this performance is at that general level of perfection. I also compared the "Billy the Kid" with the still excellent version by Eugene Ormandy and the Philadelphia Orchestra and can say that I like both of them. As other reviewers have commented, Tilson Thomas takes a more contemplative and darker read on the outlaw's story. "Rodeo" is the least interesting of the three pieces contained here but is again played well. If you want one Copland disc in your collection, this is it. 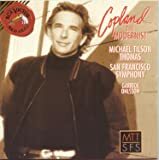 Micheal Tilson Thomas and the San Francisco Symphony Orchestra turn in great late 1990s DDD recordings of Copland's "Billy the Kid" "Rodeo" and "Appalachian Spring" which are as good as any I have heard. For comparison, I use the Bernstein/New York recordings from 1959/60 (CBS) and Tilson Thomas benefits from DDD sound. But the AAD Bernsteins are still worth hearing, and NO ONE has ever touched Lenny's "Buckaroo Holiday" or "Hoe down" for sheer sweep and driving tempo! MTT's "Appalachian Spring" is the COMPLETE score, not just the 24 minute suite most recordings offer. 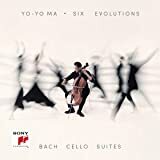 It is nice to hear the sections restored from Copland's original chamber music score, but in his own complete orchestration for large orchestra. I recommend M.TT/ San Francisco most enthusiastically. You will, also! Aaron Copland has not been a favorite composer of mine. I have liked much of his music but not been an avid collector. This is perhaps a little odd since I had a chance encounter with him a few years ago and only realized who I was standing next to after Mr. Copland had gone. 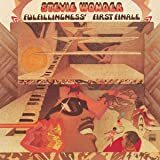 Listening to this disc has changed my mind on a great many things. In the past, I found the music for "Rodeo" a little too "folksy," as if Copland was throwing up a Norman Rockwell picture of the West. Listening to this recording has changed my view of the work to quite an interesting ballet. 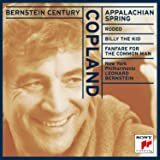 The version of "Appalachian Spring" is an orchestration (from the original for small orchestra) that Mr. Copland never published, and it may the music seem all the more new. The "Simple Gifts" music that Copland borrowed is treated far differently in this version than the more familiar orchestration. "Billy the Kid" was also a revelation for me. The performances and sound are excellent. Anyone who already know this music will appreciate this disc. Great to hear full version of Copeland's composition. Great recording, and conducted by a man who actually knew and hung out with Mr. Copland ! I am pleased with it and will look into the 'Modernist' next..